Today has been a fantastic day and it’s only 1p! Despite losing an hour of sleep last night I was up by 730 feeling well rested. I spent some time straightening up around the house before just relaxing on the couch and creating an outline for a grocery list (it’s a process). I made my way to free yoga at Lululemon for a great Baptiste style practice. I am a total yoga newbie and the free classes are perfect for me. Once I feel more comfortable and have more time I definitely want to join a studio but for now it’s the perfect once a week deeeeeeep stretch that I need. And then I came home and created the most amazing breakfast ever. As I’ve shared, I’m a total eggs-for-breakfast kind of gal, but since this was really more brunch like I was craving something different. I haven’t given much thought to how many people are reading this blog yet- I haven’t shared the link with friends or family and I know I’m just getting started. But today I wish the whole world was reading so that they could experience this deliciousness. Mix the PB2 with an extra amount of water so it is on the runnier side, add one whole egg and the cinnamon and mix. 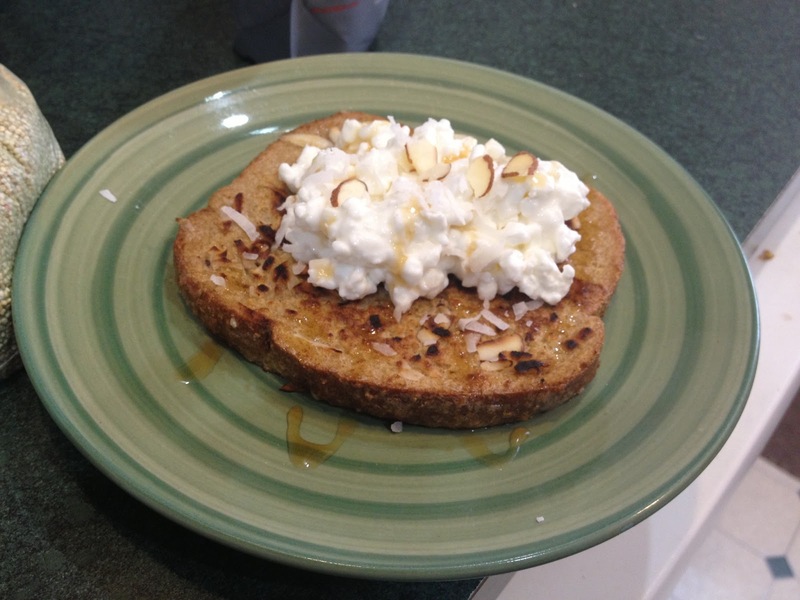 Combine the coconut and almond slivers on a plate. Heat up the pan and add the coconut oil or butter to it. Dip your bread in the PB/egg mix, covering both sides well but letting any excess drip off, and then dip each side in the coconut/almond mix. Put dipped bread into the hot pan, cook on each side until browned. I served mine with cottage cheese (protein boost! 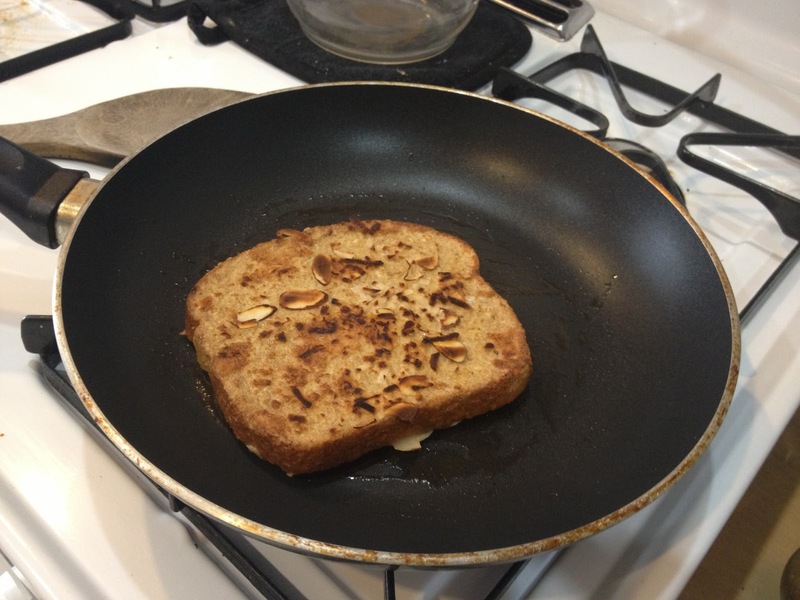 ), agave nectar and a sprinkle of coconut and almonds. So quick, so easy, and so so good! Gotta run- it’s 60 degrees (!!!! it was just snowing days ago, this is March in Ohio!) and my sister is on her way down to visit for the day. Our to-do list includes- a game of tennis, antiquing, another stop at the new Whole Foods, cooking and board games.